I get on the plane and it is a good crowd locals and what seems to be enthusiastic scuba divers. This plane will make two stops before landing in Pohnpei: First stop is in Majuro, Marshall Islands, and the second stop is in Kwajalein, Marshall Islands. Nothing but never-ending ocean separates these islands from Hawaii, and just the flight here is a truly unique experience. From Majuro to Pohnpei, I sat next to this man who had not been home for over ten years. 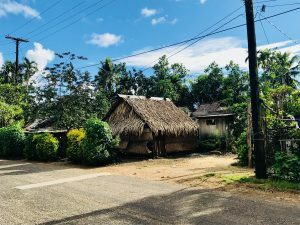 As we approached Pohnpei, his smile was about 56” wide and he was undeniably thrilled to be home for the first time in many years. Once I arrived at the airport, Joyce Roby, another fellow from the Pacific Islands Tourism Professional Fellows Program, greeted me. 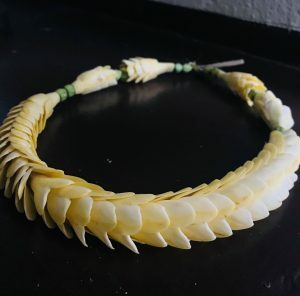 She gave me this beautiful flower wreath that I wore for the rest of the day. She told me there is an old saying that if it rains when you arrive in a new place, it is good luck. I look up, and the sun is beaming. Oh shhh…. Nevertheless, I feel very lucky to be here and I am excited for the adventures to come! The life in Pohnpei seems beautifully simple. A stroll through the local village and I find it slightly difficult to blend in. One calls, “Hey white woman!” I am told that the people here do not value materialistic things. A house is a house, as long as you have a roof over your head and a floor to sit on. Furniture does not even matter, you can sleep and sit on the floor. It is really hard not to agree without sounding like an a..hole because really, it makes sense. The following morning, I was invited to do a presentation on travel2change at the College of Micronesia. 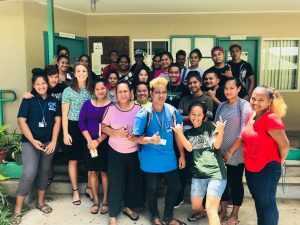 My intention was to get the students thinking about what resources they have here and what they would like to see Pohnpei become or not become in the future as tourism develops. 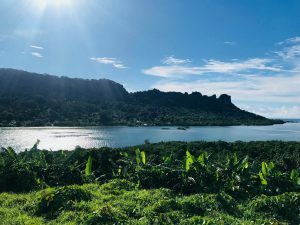 Unlike Hawaii, Pohnpei does not have a big inflow of tourists on a yearly basis. This presents a unique opportunity to “get it right” from the start. Pohnpei has everything and more to offer: Jungle, waterfalls, ruins, deep sea fishing, surfing, diving and more. 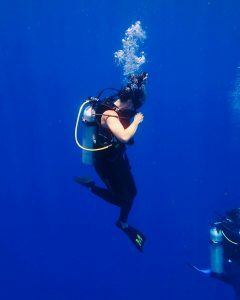 With just a few short days on island, I really wanted to go scuba diving. It is one of those things I absolutely love doing but that I just do not get around to doing a lot. Unlike some of the other Micronesian islands, Pohnpei is not known for wreck diving, but to me I really wanted to dive to see the wild life. And boy, I am so glad I did! Dolphins, big schools of barracudas, sharks (yes, I am one of those people who gets excited about seeing sharks up close! ), and lots of fish and coral. Now, I may not have had a lot of coffee while I was here, in fact the only cup of coffee I have had was when I had a meeting with the ambassador at the U.S. Embassy, but I got so much more. I met the friendliest people, encountered raw and untouched nature, and even as a single female traveller, I felt safe everywhere I went. Coffee, you will be awaiting for me in Hawaii, and that is just fine with me. Pohnpei, a piece of my heart is forever yours. Where to eat after volunteering!